Sri Aurobindo (born Aurobindo Ghose; 15 August 1872 – 5 December 1950) was an Indian nationalist, freedom fighter, philosopher, yogi, guru, and poet.He joined the Indian movement for freedom from British rule and for a duration became one of its most important leaders, before developing his own vision of human progress and spiritual evolution. 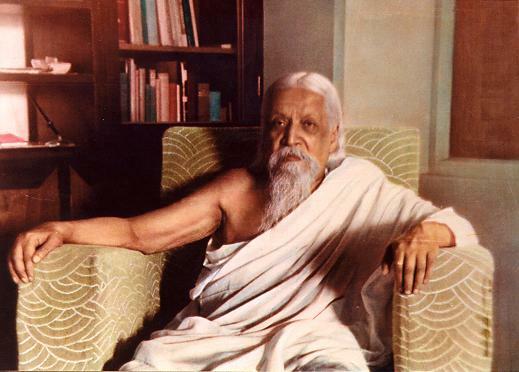 Sri Aurobindo synthesized Eastern and Western philosophy, religion, literature, and psychology in writings. Aurobindo was the first Indian to create a major literary corpus in English. His works include philosophy; poetry; translations of and commentaries on the Vedas, Upanishads, and the Gita; plays; literary, social, political, and historical criticism; devotional works; spiritual journals and three volumes of letters. His principal philosophical writings are The Life Divine and The Synthesis of Yoga, while his principal poetic work is Savitri: A Legend and a Symbol. Sri Aurobindo was born in Calcutta, India, to Dr. Krishna Dhan Ghose, District Surgeon of Rangapur, Bengal, and Swarnalata Devi, the daughter of Brahmo religious and social reformer, Rajnarayan Basu. Dr. Ghose chose the middle name Akroyd to honour his friend Annette Akroyd. Aurobindo spent his first five years at Rangapur, where his father had been posted since October 1871. Dr. Ghose, who had previously lived in Britain and studied medicine at King’s College, Aberdeen, was determined that his children should have an English education and upbringing free of any Indian influences. In 1877, he therefore sent the young Aurobindo and two elder siblings – Manmohan and Benoybhusan – to the Loreto Convent school in Darjeeling. Aurobindo spent two years at Loreto convent. In 1879, Aurobindo and his two elder brothers were taken to Manchester, England for a European education. The brothers were placed in the care of a Rev. and Mrs. Drewett. Rev. Drewett was an Anglican clergyman whom Dr. Ghose knew through his British friends at Rangapur. The Drewetts tutored the Ghose brothers privately. The Drewetts had been asked to keep the tuitions completely secular and to make no mention of India or its culture. In 1884, Aurobindo joined St Paul’s School. Here he learned Greek and Latin, spending the last three years reading literature, especially English poetry. Dr. K.D. Ghose had aspired that his sons should pass the prestigious Indian Civil Service, but in 1889 it appeared that of the three brothers, only young Aurobindo had the chance of fulfilling his father’s aspirations, his brothers having already decided their future careers. To become an ICS official, students were required to pass the difficult competitive examination, as well as study at an English university for two years under probation. With his limited financial resources, the only option Aurobindo had was to secure a scholarship at an English university, which he did by passing the scholarship examinations of King’s College, Cambridge University. He stood first at the examination. He also passed the written examination of ICS after a few months, where he was ranked 11th out of 250 competitors. He spent the next two years at the King’s College. By the end of two years of probation, Aurobindo became convinced that he did not want to serve the British, he therefore failed to present himself at the horse riding examination for ICS, and was disqualified for the Service. At this time, the Maharaja of Baroda, Sayajirao Gaekwad III was travelling England. James Cotton, brother of Sir Henry Cotton, for some time Lt. Governor of Bengal and Secretary of the South Kensington Liberal Club, who knew Aurobindo and his father secured for him a service in Baroda State Service and arranged a meeting between him and the prince. He left England for India, arriving there in February, 1893. In India Aurobindo’s father who was waiting to receive his son was misinformed by his agents from Bombay (now Mumbai) that the ship on which Aurobindo had been travelling had sunk off the coast of Portugal. Dr. Ghose who was by this time frail due to ill-health could not bear this shock and died. Aurobindo used to take many excursions to Bengal, at first in a bid to re-establish links with his parents’ families and his other Bengali relatives, including his cousin Sarojini and brother Barin, and later increasingly in a bid to establish resistance groups across Bengal. But he formally shifted to Calcutta (now Kolkata) only in 1906 after the announcement of Partition of Bengal. During his visit to Calcutta in 1901 he married Mrinalini, daughter of Bhupal Chandra Bose, a senior official in Government service. Sri Aurobindo was then 28; the bride Mrinalini, 14. Marrying off daughters at a very young age was very common in 19th century Bengali families. In Bengal with Barin’s help he established contacts with revolutionaries, inspiring radicals like Bagha Jatin, Jatin Banerjee, Surendranath Tagore. He helped establish a series of youth clubs with the aim of imparting a martial and spiritual training to the youth of Bengal. He helped found the Anushilan Samiti of Calcutta in 1902. When the Partition of Bengal was announced, there was a public outpouring against the British rule in India. Aurobindo attended the Benares session of Congress in December 1905 as an observer, and witnessing the intensity of people’s feelings decided to throw himself into the thick of politics. He joined the National Council of Education and met Subodh Chandra Mullick who quickly became a supporter of Aurobindo’s views. Mullick donated a large sum to found a National College and stipulated that Aurobindo should become its first principal. Aurobindo also started writing for Bande Mataram, as a consequence of which, his popularity as a leading voice of the hardline group soared. His arrest and acquittal for printing seditious material in Bande Mataram consolidated his position as the leader of aggressive nationalists. His call for complete political independence was considered extremely radical at the time and frequently caused friction in Congress. In 1907 at Surat session of Congress where moderates and hardliners had a major showdown, he led the hardliners along with Bal Gangadhar Tilak. The Congress split after this session. In 1907–1908 Aurobindo travelled extensively to Pune, Bombay and Baroda to firm up support for the nationalist cause, giving speeches and meeting various groups. He was arrested again in May 1908 in connection with the Alipore Bomb Case. He was acquitted in the ensuing trial and released after a year of isolated incarceration. Once out of the prison he started two new publications, Karmayogin in English and Dharma in Bengali. He also delivered the Uttarpara Speech s:Uttarpara Speech hinting at the transformation of his focus to spiritual matters . The British persecution continued because of his writings in his new journals and in April 1910 Aurobindo signalling his retirement from politics, moved to Pondicherry. Aurobindo’s conversion from political action to spirituality occurred gradually. Aurobindo had been influenced by Bankim’s Anandamath. In this novel, the story follows a monk who fights the soldiers of the British East India Company. When in Baroda, Aurobindo and Barin had considered the plan of a national uprising of nationalist sannyasis against the empire. Later when Aurobindo got involved with Congress and Bande Mataram, Barin had continued to meet patriotic youngsters for recruitment for such a plan. In 1907, Barin introduced Aurobindo to Vishnu Bhaskar Lele, a Maharashtrian yogi. The trial (“Alipore Bomb Case, 1908”) lasted for one full year, but eventually Sri Aurobindo was acquitted. His Defence Counsel was Chiitaranjan Das. On acquittal, Sri Aurobindo was invited to deliver a speech at Uttarpara where he first spoke of some of his experiences in jail. Afterwards Aurobindo started two new weekly papers: the Karmayogin in English and the Dharma in Bengali. However, it appeared that the British government would not tolerate his nationalist program as then Viceroy and Governor-General of India Lord Minto wrote about him: “I can only repeat that he is the most dangerous man we have to reckon with.” The British considered the possibilities of a retrial or deportation, but objections from Lord Minto, or the Bengal government at different instances prevented immediate execution of such plans. When informed that he was sought again by the police, he was guided to the French territory Chandernagore where he halted for a few days. On April 4, 1910, he finally landed in the French colony of Pondicherry. For some time afterwards, Sri Aurobindo’s main literary output was his voluminous correspondence with his disciples. His letters, most of which were written in the 1930s, numbered in the several thousands. Many were brief comments made in the margins of his disciple’s notebooks in answer to their questions and reports of their spiritual practice—others extended to several pages of carefully composed explanations of practical aspects of his teachings. These were later collected and published in book form in three volumes of Letters on Yoga. In the late 1930s, Sri Aurobindo resumed work on a poem he had started earlier—he continued to expand and revise this poem for the rest of his life. It became perhaps his greatest literary achievement, Savitri, an epic spiritual poem in blank verse of approximately 24,000 lines. During World War II, he supported the allies, even donating money to the British Government, describing Hitler as a dark and oppressive force. On August 15, 1947, on his 75th birthday, when India achieved political independence, a message was asked from Sri Aurobindo. In his message, which was read out on the All India Radio, Sri Aurobindo dwelt briefly on the five dreams he has cherished all his life and which, he noted, were on the way to being fulfilled. Sri Aurobindo died on December 5, 1950, after a short illness. Sri Aurobindo’s close spiritual collaborator, Mirra Richard (b. Alfassa), came to be known as The Mother simply because Sri Aurobindo started to call her by this name. On being asked by why he called her the Mother, Sri Aurobindo wrote an essay called The Mother in order to shed light on the person of Mirra. Mirra was born in Paris on February 21, 1878, to Turkish and Egyptian parents. Involved in the cultural and spiritual life of Paris, she counted among her friends Alexandra David-Neel. She went to Pondicherry on March 29, 1914, finally settling there in 1920. Sri Aurobindo considered her his spiritual equal and collaborator. After November 24, 1926, when Sri Aurobindo retired into seclusion, he left it to her to plan, run and build Sri Aurobindo Ashram, the community of disciples that had gathered around them. Some time later when families with children joined the ashram, she established and supervised the Sri Aurobindo International Centre of Education which, with its pilot experiments in the field of education. When Sri Aurobindo died in 1950, the Mother continued their spiritual work and directed the Ashram and guided their disciples. In the mid-1960s she personally guided the founding of Auroville, an international township endorsed by UNESCO to further human unity near the town of Pondicherry, which was to be a place “where men and women of all countries are able to live in peace and progressive harmony above all creeds, all politics and all nationalities.” It was inaugurated in 1968 in a ceremony in which representatives of 121 nations and all the states of India placed a handful of their soil in an urn near the center of the city. Auroville continues to develop and currently has approximately 2100 members from 43 countries, though the majority consists of Indians, French, and Germans. The Mother also played an active role in the merger of the French pockets in India and, according to Sri Aurobindo’s wish, helped to make Pondicherry a seat of cultural exchange between India and France. The Mother stayed in Pondicherry until her death on November 17, 1973. Her later years, including her myriad of metaphysical and occult experiences, and her attempt at the transformation at the cellular level of her body, are captured in her 13-volume personal log known as Mother’s Agenda. One of Sri Aurobindo’s main philosophical achievements was to introduce the concept of evolution into Vedantic thought. Samkhya philosophy had already proposed such a notion centuries earlier, but Aurobindo rejected the materialistic tendencies of both Darwinism and Samkhya, and proposed an evolution of spirit along with that of matter, and that the evolution of matter was a result of the former. He describes the limitation of the Mayavada of Advaita Vedanta, and solves the problem of the linkage between the ineffable Brahman or Absolute and the world of multiplicity by positing a hitherto unknown and unexplored level of consciousness, which he called The Supermind. The supermind is the active principle present in the transcendent Satchidananda as well in the roots of evolution: a unitary level of which our individual minds and bodies are minuscule subdivisions. Sri Aurobindo rejected a major conception of Indian philosophy that says that the World is a Maya (illusion) and that living as a renunciate was the only way out. He says that it is possible, not only to transcend human nature but also to transform it and to live in the world as a free and evolved human being with a new consciousness and a new nature which could spontaneously perceive truth of things, and proceed in all matters on the basis of inner oneness, love and light.